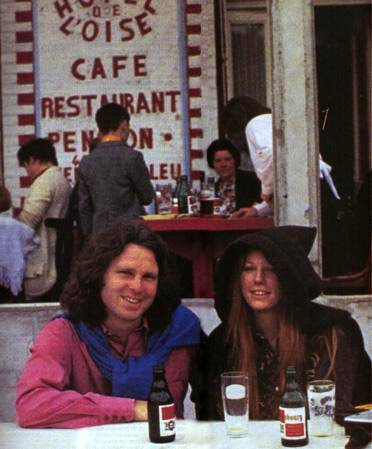 Jim Morrison and Pamela Courson in Paris (photographer Alain Ronay). 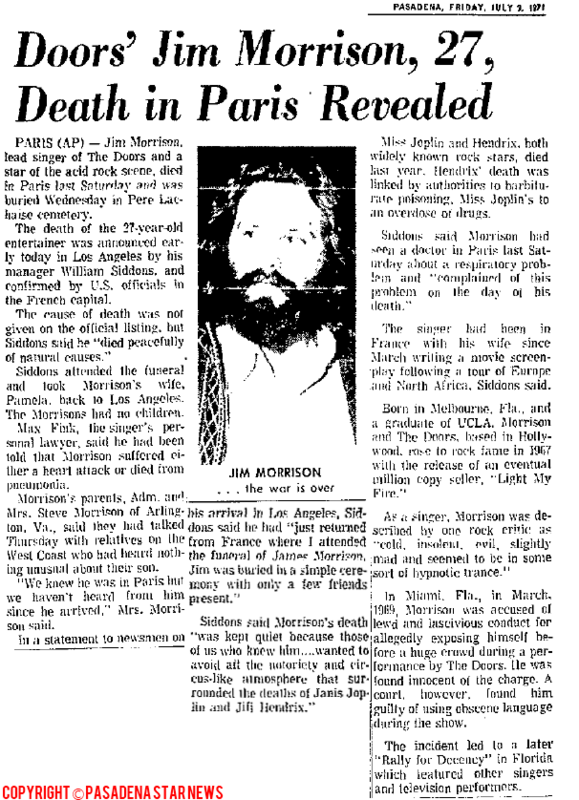 PARIS, FRANCE – Jim Morrison talked as early as 1967 about pulling a death stunt, to help draw publicity for The Doors, and pondered what it might be like to switch careers entirely, and simply start over. Since Jim Morrison’s “death” on July 3, 1971 at the age of 27, his star has only risen, and his grave at Pere Lachaise Cemetery in Paris, is one of the city’s biggest attractions, behind the Eiffel Tower, where the faithful flock and leave flowers, as well as graffiti tributes, for the 60’s music icon, poet, and songwriter. However, could they be visiting an empty tomb? Only days in fact before July 3, Morrison had visited Pere Lachaise himself, and is said to have picked out the plot he ended up in, and stated he would like to eventually be interred there. Most of those buried there are French, and many are notable people (Edith Piaf, Oscar Wilde, Moliere, to name a few), as Pere Lachaise is a national institution for the French rich and famous, as far as a final resting place is concerned. There are over one million “occupants” who lie there, and a waiting list exists to be laid there eternally. There is a maximum a 30-year lease on graves at this world-known memorial ground, unless one chooses perpetual care. If after 30 years, the family members of the deceased choose not to renew the grave plot, the bones are removed, and the skeletal remains are transferred to the “Aux Morts Ossuary,” a modern-day catacomb, where they are tagged and stored. Counting occupants in the ossuary, the “residents” at Pere Lachaise tops three million. 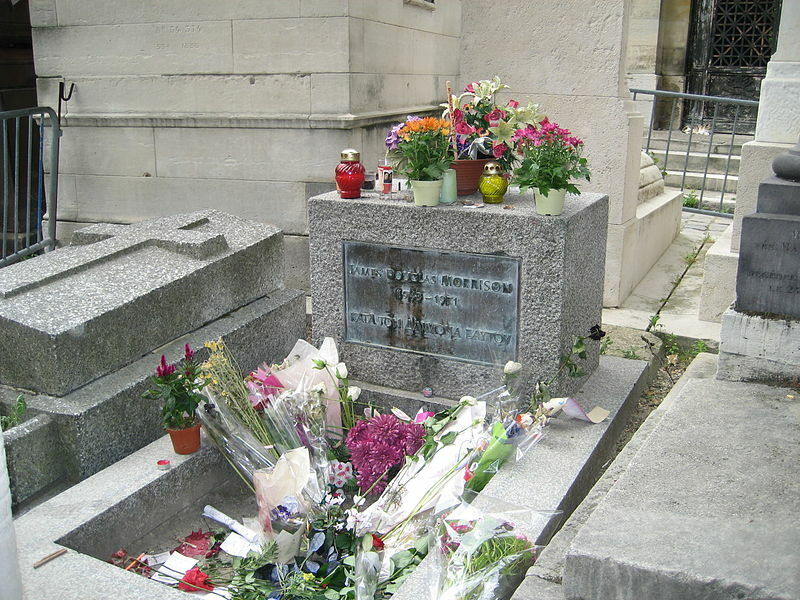 Many were surprised Jim Morrison’s body could have been so easily accommodated at Pere Lachaise, especially as an American expat, even if he was Jim Morrison. His common law wife, Pamela Courson, chose the 30-year option for his plot, which eventually was turned to perpetual care, courtesy of Jim Morrison’s parents. His grave has a cult-like following, not just by the curiosity-seekers who may know little about the star, and wish to see one of the most known graves in Pere Lachaise and on the planet for that matter, but also by the truly devoted, and everyone in between. In addition to the perpetual care option, Morrison’s parents kicked in the cleaning equipment for the cemetery to mop up the constant “art” adorned on his grave, as part of their maintenance routine. In addition to graffiti and vandalism, visitors have left other gifts there, including used condoms, cigarettes, and empty bottles of alcohol. The grave is also heavily guarded, including with cameras, due to the vandalism and activities that have taken place there. So better smile if you try to vandalize, disturb, or dig up the plot of “The Lizard King,” and be ready to dole out cash for a fine, which will send your vacation monies down the drain. All this fuss when no one, except Courson and a doctor she hired, Dr. Max Vasille, have claimed to have seen the body. So Courson’s story goes, she found Morrison in the bathtub, half-submerged, and when she touched him, blood trickled from his nose. So the story goes, Morrison had been ill, and had vomited blood before he expired. Apparently he had been snorting heroin, supposedly his preferred method, with many claiming he greatly feared needles. Others have stated Morrison eschewed drugs totally, so this tale is far-fetched. And others have said not to believe Courson’s account, that her version changed over the years, as to the exact events, even with a claim that she had a hand in her love’ s death. There was no autopsy on Morrison because in France, if there is no foul play, an examination is not performed. The doctor allegedly did not notice foul play. Did any “play” ever happen at all? As much as this reporter is not into conspiracy theories, even she questions if Jim Morrison still lives. Too much evidence weighs, some he left behind himself, that perhaps he headed for the hills. This highly-talented man had the means, and desire, to go off the radar altogether, at the height of his fame. He expressed that as a plan. He said an overdose was not the way he wanted to go. And his fame has climbed even after he has apparently left here, something also part of “death stunt” idea. One of the reasons he left for Paris itself was solace. Could he be somewhere now (highly possible he could have still lived, if he did not in fact die on July 3, since he would only turn 70 this coming December), enjoying some remote location, and penning his amazing poetry in peace? Courson herself died of a heroin overdose in 1974 (a whole story in itself, since she inherited Morrison’s entire estate, and in turn, her parents trumped Morrison’s parents even after a legal battle initiated by Morrison’s parents, and they inherited their daughter’s fortune from Morrison). With Courson dead, and Vasille remaining mum over the years about what he observed, and he has also since gone to his grave, the only two “witnesses” are gone themselves. Morrison’s death has remained a mystery since. Not to mention the strange news blackout after Morrison’s passing. His death remained hush-hush for a few days, before the news began to leak, and no one, not even his parents, were able to see his corpse, and his manager supposedly chose not to. Vasille wrote “heart failure,” on his report, though many contend Morrison’s doctor in the United States said his heart was healthy. The burial took place on July 7, after Courson purchased the cheapest basic box coffin possible (the whole burial cost less than $1,000), and the ceremony was brief, or in the words of a Madame Colinette, a local who witnessed to it from nearby while visiting her recently departed husband, it was “pitiful.” Lasting only a few minutes, Colinette said no one stood around to shed a tear, said only a few words, tossed some flowers down, and left quickly. The suggested events leading up to his death, have varied over the years, some bordering on the bizarre. Being carted out of Rock ‘n’ Roll Circus nightclub, after expiring in the club’s bathroom, and returned to his apartment, is one tale. Death by remote voodoo was another. Others claim government cover ups of various kinds. Morrison “sightings” however, began happening after his death, with one person reporting that weekend, they watched Morrison get on to an airplane. Mr Mojo Risin, the phone lines, and now email, Facebook, and Twitter, are still open.